Woo Woo! Woo Woo! Nobody Can Do It Like A Steam Train! Perhaps you are wondering what the train picture has to do with anything else on my home page. Well, there is a long history of railroading in my family. I am old enough to remember steam operation on Canada's railways, and when my father was a youngster, he spent a lot of time travelling round in the cab of Canadian Government Railways' #2922 "Mikado" freight locomotive, driven by my great uncle Eddy. (That's uncle Eddy and the rest of train crew with their "Mighty Mike" over at the left; he is the guy in overalls up at the top of the engine, next to the bell.) I dreamed of driving that big engine when I grew up, but alas! I had to get a life. I still take steam excursions every chance I get. In the summer of 1996, we had a ride on the South Simcoe Railway behind ex CP #136, which looks a lot like the engine in the cartoon on the home page. Thanks to the wonderful people at the National Archives of Canada, and the records of Canadian National Railways, I have been able to piece together some of the history of my great uncle's big freight locomotive, which was built 80 years ago. For those who may wish to know, a Mikado steam locomotive received its name because the very first engines with that wheel arrangement were made for Japanese railroad use. The Mikado had a 2-8-2 wheel arrangement: two leading wheels, eight drivewheels and two trailing wheels. This arrangement gave a large firebox configuration and an impressive tractive effort. Mikados were the most powerful freight engines on the lines until the 1930s when the ponderous 2-10-2 Santa Fe and 2-10-4 Texas locomotives came along for heavy freight transfer. The "Mikes" were supplanted on CNR fast freights by the classic 4-8-4 Northerns at the end of the steam era, but continued in their role of out and out hard working freight "hogs" until well into the 1950s. Here is the story of Uncle Eddy's Mike. In July 1917, the Montreal Locomotive Works completes Job #58369, a model S-1-b Mikado. The new engine is the property of the former Canadian Northern Railway, now known as Canadian Government Railways. It is about this time that Uncle Eddy, who has likely been driving a Canadian Northern 2-8-0 "Consolidation", gets behind the throttle of this big new machine. The engine receives the number 2922. In 1923, the Grand Trunk and C.G.R. become the Canadian National Railway. In revamping the locomotive rosters the Mikes are renumbered; former 2800 and 2900 series become 3200 and 3300. Hence #2922 becomes #3322. The history becomes a little harder to trace. 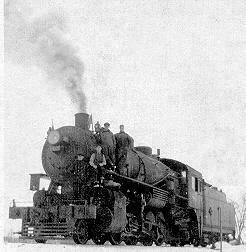 In March of 1931, #3322 is now assigned to the Manitoba district, and undergoes a boiler refit at the Transcona shops. Thermic syphons are applied to the boiler, and the engine probably receives a feedwater heater which radically alters her appearance. This makes it even harder for a latter day detective to trace her history. In September 1936, #3322 undergoes another boiler refit at Transcona. She is still assigned to the Manitoba district and the high mineral content of Prairie water is taking its toll. In December 1947, #3322 is now in the Atlantic region. At that time 475 Mikados are still hard at work on the CNR. Out of 2583 locomotives, only 75 diesels and 24 electric cars are running on the railroad. #3322 is judged to be in poor condition and is scheduled for repairs. In January 1948, #3322 undergoes another boiler refit in the Moncton, N.B. shops. Here the official trail ends. It is likely that the engine continued to haul freight into the mid 1950s. The big engine and the old man who loved her so much disappeared from history about the same time about 40 years ago. None of the S-1-c class of Mikados survived the scrapper's torch. One S-1-a (#3239) is preserved at the Canadian Railroad Historical Museum in Delson, Que. An S-1-b (#3254) is still operating at Steamtown, where another S-1-d (#3377) is on display. This page last modified on June 19, 2001.